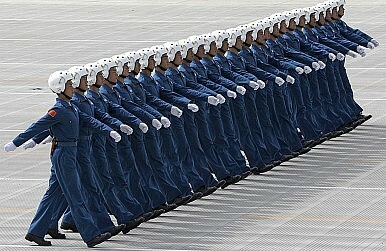 The People’s Liberation Army has reportedly established a fifth military service dedicated to aerospace operations. China has created a fifth branch of the People’s Liberation Army devoted to space operations, a Japanese newspaper is reporting. Last month, Yomiuri Shimbun — one of Japan’s national papers — carried a report that said that China had recently ordered the PLA to establish an Aerospace Force. The branch, which is expected to focus on military operations in space, would be the military’s fifth branch after the PLA Ground, Air, Naval, and the Second Artillery (in charge of China’s nuclear arsenal and ballistic missiles) Forces. It will be complemented by an Aerospace Office under the Central Military Commission. The Diplomat cannot confirm the validity of the report, and it’s notable that Yomiuri Shimbun appears to have taken the original article down in the last few days (a cached version can be found here). The Pentagon also refused to comment on the article, referring The Diplomat instead to the PLA. Still, the claim seems plausible on the face of it. As The Diplomat previously noted, while visiting a PLA Air Force Base in April of this year, Xi Jinping urged military officers “to speed up air and space integration and sharpen their offensive and defensive capabilities.” He also called for the creation of a “new type of combat unit” dedicated to this purpose. The China Daily article also noted that China had long emphasized the need to better integrate space and air capabilities. In addition, earlier this year the California-based security firm CrowdStrike released a report tying a PLA cyber unit, Unit 61486, to an extensive, years-long hacking campaign aimed at stealing information from satellite and aerospace companies in both the United States and Europe. “The group has been operating since at least 2007 and has been observed heavily targeting the U.S. Defense and European satellite and aerospace industries,” CrowdStrike noted in the report. U.S. military officials later confirmed they knew of the existence of the group before the report was released. Notably, the Yomiuri Shimbun article mentions the new Aerospace Force unit as an afterthought in a larger article about the new Joint Operations Command Center the PLA has established as a way to strengthen joint operations between different military services. This is significant because joint operations and space capabilities were both emphasized as central features of the Chinese military doctrine of winning “local wars under modern, high-tech conditions” (later changed to “local wars under informationized conditions”). Of course, China has been steadily expanding the PLA’s space capabilities, including conducting an anti-satellite test (ASAT) earlier this year as well as last year. It also conducted an ASAT test in 2007 that destroyed a defunct Chinese weather satellite.